From this tutorial you’ll learn how to add content using Images Layout JetElements module for Elementor. 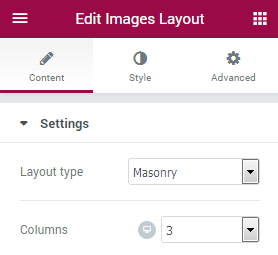 Images Layout module displays images using different eye-catching layout types, such as Masonry, Justify, Grid or List. Add images and customize layouts in several clicks to get the stunning results and adorn Your website pages with beautiful imagery! Layout type — here you can select one of several image layouts available for this module (Masonry, Grid, Justify, Grid, List). Columns — here you can select the number of columns to display the images in this module. Image — click on the Image area to select the image from the Media Library or upload one from your hard drive. Icon — here you can set the icon for the image. Title — here you can input the title of the image. Description — in this field you need to provide the image description. Link type — here you need to specify if you want the link to be external or lightboxed. External Link — here you can provide the URL address of the external link.